Wise Man Racine gave an enthralling and faith-strengthening message on the title, ‘The Living Word’, part of which explained the relationship of faith and the Word to the Lord. According to him, we live by faith. Those who live by faith are victorious. God’s Word is our standard. It carries us into the presence of God. One lives by the Word of God or misses the point. Faith acts on God’s Word. Citing Hebrews 4:3 as a proof text, the wise man explicated his message. In Genesis 1:3 according to him, God says, ‘Let there be light’ and there was light. God’s Word is a Spirit which creates material things. God is in His Word. He does nothing without His Word. Christ and the Word are one. Through the Word we have access to God. He uses His Word to bring about healing. The Word of God is the seed of divine life that causes faith to grow. Faith grows when the Word of God prevails over the thinking processes. Meditation in the Word of God is a visit with Him. Meditation brings revelation which brings result and power. The extent to which you think of the Word of God is the extent to which you have the power of God, the wise man reminded his listeners as he came close to the end of the message. Soon after the applauded message, Prophet T.B. Joshua spoke briefly about the new Anointing Water and generated a wind of spontaneous excitement among those who received it the previous week. Many came forward to testify to the unforeseen grounds of miracles it broke following its application. Henry Onyebetor of Delta State was the first to give a testimony. According to him, he had been suffering from glaucoma for over ten years for which he had sought a cure but unsuccessfully. 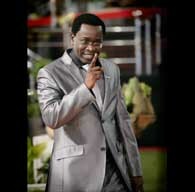 He came to The SCOAN and received the new Anointing Water. On getting home, he applied it as instructed in the booklet. Before long, he regained his sight and could read well. When he went to hospital for examination, the doctor wondered audibly whether Henry had at any time been diagnosed with glaucoma before. However, in his dream, Henry was attacked until the prophet came to his rescue. He ended by thanking God and His anointed servant, Prophet T.B. Joshua for restoring his sight. 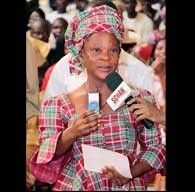 Taking her turn to relate her testimony, Cecilia of Ogoja, Cross-River State informed her listeners that she had had diabetes since 2004 and had been in the sickbed praying. As a consequence of her poor condition, her menstruation also ceased after five years. A friend of hers from the north met her and gave her the Anointing Water which put an end to the diabetes. The same friend also gave her money to come to The SCOAN to testify to the goodness of God regarding her healing. Another lady, Agnes Roman, a widow from Delta State also gave a testimony. Getting home from The SCOAN where she received the new Anointing Water, she prayed with her family and gave each of them an administration of it about 10 0’clock before they all retired to bed. Moments later, one of her sons, Precious started screaming and vomiting blood. The son said he was being tormented with fire all over his body. He then confessed that he was initiated into a cult five years before in school. As the screaming and vomiting continued unabated, the mother called a phone number in the church through which she was advised to administer the Anointing Water to Precious again. As soon as she did that, both vomiting and screaming stopped. Precious had also submitted his elder brother’s name to the cult for elimination before August for constantly challenging his coming home late every day. True to his wish, the elder brother fell sick. In his own testimony, Precious admitted all the facts given about him by his mother and added that he had joined the cult many years before the death of his father, though no member of the family knew about it. Ironically he was reputed to be a very quiet and good boy, much loved by the mother. His, according to the prophet, was a deliverance from darkness to light and salvation, adding that his elder brother who was sick, weak and haggard apparently as a consequence of the evil plans of Precious would be arranged in the prayer line for healing. Stephen, a Chief Superintendent of Customs from Taraba State also mounted the platform for a testimony. In his words, he had had diabetes for some time making him urinate at least eight times every night. Two days to the administration of the new Anointing water, his condition became so bad that every five minutes he would urinate. 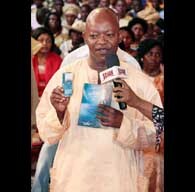 He came to The SCOAN for the Anointing Water and after application, the frequent urinating stopped completely. He now urinates once a night. He thanked God for His anointed servant, Prophet T.B. Joshua who restored his health to normalcy through the medium of the new Anointing Water. In course of the mass prayer during the previous service, many with contrary spirits were arrested and fell down in manifestation. One of these was a notorious armed robber named Kelechi. He had a gang of armed robbers with whom he unleashed criminality on innocent people. He had been caught, tried and imprisoned but became more hardened and brutal to his victims on regaining freedom. He had rendered himself invulnerable by meeting witch doctors for charms. He had the head of a three -year -old baby in him which told him what to do during robbery operations. At deliverance, he found it difficult to get up complaining that the baby had held his waist stiff. It was not until he shouted, ‘Jesus’ as instructed by the prophet that he was able to get up and thank God for his deliverance. The man of God who had been playing host to him had course to ask him to mount the platform for more revelations about himself. He informed his listeners that he had been involved in robbery for seventeen years and that he was a leader of a gang of fifteen. He had a singlet which was bullet repellent and which he washed only with urine. One of his victims was his elder brother who he loved very much. On the fateful day he had warned the brother not to travel in one direction of the vicinity which would be the terrain for robbery operations that day. However his brother misunderstood him and travelled in that direction. When Kelechi and his gang stopped the bus in which his brother was travelling, the latter emerged from the bus but there was nothing Kelechi could do other than make him go the same way as the other victims. 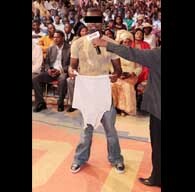 As regards his bullet repelling singlet, the prophet ridiculed the devil by shouting, ‘Jesus’ and there was Kelechi limbs, trunk and head on the floor. Many of those who had wished the wise men to lay hands on them or prophesy to them felt consoled when the prophet pronounced that the service would start again at 12 noon on Monday. 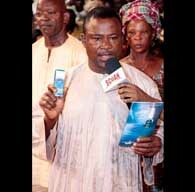 This entry was posted in Divine Healing, Divine Teaching, SCOAN Debate, Sermons, Testimonies and tagged Constant Criticism, Emmanuel TV, Jonathan Eze, Nigerian Compass, Pentecostalism, Persecution, Prophecy, Prophet TB Joshua, TB Joshua, The Synagogue Church Of All Nations on March 29, 2011 by TB Joshua Fans UK Blog. You have made known to me the path of life, you will fill me with joy in your presence with eternal pleasures at your right hand. The Holy Bible advises us that our God Almighty have known to us the path that leads to life through his Living Word and his presence will fill us with everything we need. God Almighty has set life and blessings. I encourage people of God to choose life so that you and your children may live and that you may have the Lord your God listen to his voice and hold fast to him. For the Lord is our life and he will give us life as he did to Abraham Isaac and Jacob. Do good and to be rich in good deeds and be generous and willing to share. In this way you lay treasure for yourselves as firm foundation for the coming age so that they may take hold of the life that is truly life. Let us store up four ourselves the treasures in heaven where moth and rust do not destroy and where thieves do not break in. For where our treasure is, there our heart will also be. Everyone who wants to live a Godly life will be discouraged to do it. But I encourage you children of God to continue to serve and love the Most High God. Jesus Christ is the way the truth and the life. Blessed is the children of God who perseveres under trial, because when he has hold on to Lord Jesus Christ, he will receive the crown of life that our Maker has promised to those who love his Living Word and those who love him. Let us show our good life by deeds done in humility that comes from Jesus Christ. His divine power has given us everything we need for life and godliness through the knowledge of him who called us by his own glory and goodness. Almighty God has given us eternal life and the life is in his beloved Son Lord Jesus Christ. He who has the Son has life.